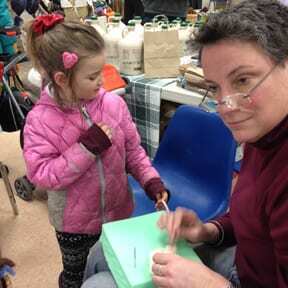 Winter farmers markets use special activities like felting to attract attendees to markets during the cold months. Looking for fresh vegetables and locally raised meat in the middle of winter? Just head on over to your local winter farmers market. Central Vermonters have several choices for relieving that fix for Vermont produce. There’s the bi-weekly Montpelier winter market and the monthly markets in Northfield and Groton. The Groton Growers Winter Farmers Market takes place on the third Saturday of the month (Feb. 20 is the next one) from 10 a.m. to 1 p.m. in the gymnasium at the Groton Community Building behind the Town Clerk’s office. It usually ends in May, but it might be cut short a month early this year. Market manager Jennifer Bone, who has been doing markets for over 20 years, said the market offers a nice variety. With limited space for a tight-fitting 24 vendors, she makes sure the market is always diverse and balanced with a selection of meats, cheese, vegetables, maple syrup, soap and crafts. This is the time of year where the winter market slows down though with the holiday season in the rear view mirror. The weekly summer market opens at the end of May and will move outside to the front lawn of the community building. It’s not easy keeping a winter farmers market going, especially in a small town. Groton is a town of a little over 1,000 residents, and Bone said they have tried everything from raffles, wrap your own present stations, and gift baskets to entice marketgoers. It’s easier in the summer when the market can advertise at the campground to pull in campers who want to experience the tomato, strawberry, and apple festivals, but Bone said their regular vendors do pretty well in the winter. While the Capital City Farmers’ Market is one of the highest attended markets in the state, it also has to deal with challenges in the cold months as well. Saturday, February 20 will mark the second time the market will be in the cafeteria at Montpelier High School. For the first half of the winter schedule, the market was in City Hall, where attendees could enjoy live music or cooking demonstrations in a more spacious environment. Now, in a smaller space and with eight fewer vendors, it will be truly a farmers market without crafters and some of the prepared foods. Market manager Carolyn Grodinsky said a big challenge has been having the winter market split between two different sites and being bi-weekly. They do have a solid selection of meats and poultry and 25 vendors, even though the wide variety of vegetables won’t be available until the summer. After Saturday, there will be four more winter markets in Montpelier on March 5 and 19, and April 2 and 16. They’re open from 10 a.m. to 2 p.m. But if you can’t make it to Montpelier or Groton, Plumley Armory on the campus of Norwich University, hosts the Northfield Winter Farmers Market. The final two markets are scheduled for March 6 and April 7.